This week's Survivor episode is like working at a soft-serve ice cream stand: a lot of twists. Lauren notices a piece of parchment in a bag of nails and quickly snags it. 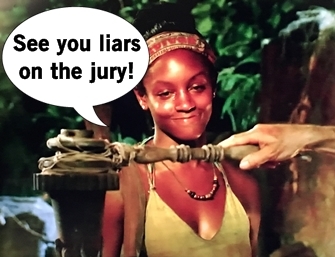 She sneaks away and learns that if she doesn't vote in this week's Tribal Council then at any future Tribal Council she'll have an extra vote. But one twist isn't enough so there's a new Hidden Immunity idol clue beneath a big ol' family style spaghetti platter (devoured by the winners one-by-one). Third eater Cole discovers the clue and tries to hide it by placing the spaghetti on a napkin, then putting the napkin over the plate. Chrissy finds it weird that there's no plate, but quickly discovers the plate and clue under the napkin. Ryan reads the clue and dumps the evidence like a murderer in a Lifetime movie by hiding it in the trees. 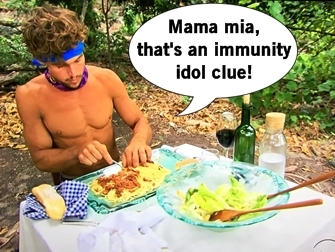 Upon their return to camp, Ryan quickly acquires the idol from below the tribe flag. Chrissy covers the tracks by returning the sand, but Cole returns from an ill-timed pee break and assumes she's digging. It's an all out shoving and digging brawl that ends with everyone suspecting Cole got it but him leaving empty handed with a target on his back. In true Survivor fashion, top target Cole wins the endurance/balance Immunity Challenge and secures his safety for three more days. The Hustler/Hero alliance decide the girls in the alliance will vote Joe and the men will vote Desi, just in case there's an idol. Since the Healers are lacking an idol (an unaware of Dr. Mike's), Joe tries to flip the Hustlers on Ben and Ben overhears everything. Ben confronts Joe and the argument escalates when Joe claims Ben swore on the Marines. 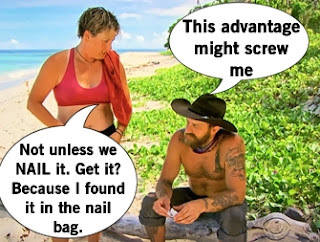 While Ben's allies have no desire to turn on him yet, a split vote combined with Lauren's advantage to note vote could give the Healers the majority to vote out Ben. So the game changes up again with Ben trying to flip Dr. Mike the healer to his side. Could Lauren's advantage accidentally take out her closest ally? Tribal Council time! Joe says regardless of playing an idol successfully he's always feeling the heat, then ousts Ben as the ringleader. Ben says his alliance makes decisions together and they have each others backs. He also stresses he would never swear on the Marines and apologizes to Joe and the tribe for losing his cool earlier. Dr. Mike mentions feeling betrayed after the Yawa thing fell apart at the last vote, Desi talks about lies and personal moral lines, and Devon gives a rambling speech that I think was about being low energy but honestly, no clue. The tribe votes and when Jeff reveals the votes, no one seems to realize they're short a vote. But there is a tie between Desi and Joe, requiring a re-vote. Being a strong physical competitor, Healer, and probably he ties to Joe gets Desi eliminated and a place as the first member of this season's jury.